As a forever Faithful San Francisco 49ers fan, I did NOT see this coming. In case you missed it, last night’s Monday Night Football game was deemed the Battle of the Backups. San Francisco’s QB Alex Smith and Chicago’s Jay Cutler, both starting QB’s for their respective teams, were out as a result of concussions they sustained last week. So starting in their place you had Colin Kaepernick for the 49ers and Jason Campbell for the Bears. BOY OH BOY!!! Ok, that is not how I really felt when the game started. I honestly did not know what to think. Kaepernick, lets call him Kaep, had been used sparingly during the season so I do not think anyone outside of the team really knew what to expect from him. My, my what a pleasant surprise. Not only was Kaep playing like he had been a starting NFL QB five years, he controlled the offense from start to finish. Lets check the numbers. 16/23 for 243 yards. 12 yards rushing. Yes, those were an important 12 yards. 133.1 passer rating and the single highest QBR rating for a first timer, 97 out of 100. Simply put, he was balling. Now conventional wisdom says, a QB should not lose his job because of an injury. Well, we all know San Francisco head coach Jim Harbaugh is anything but conventional. When asked last night about who would be the starter on Sunday, he simply replied that he “usually goes with the guy with the hot hand.” Welp, sounds like Smith may be on the bench for another week. Lets face it. Today may be too soon to start the QB controversy talk or is it? Yes, in his last 25 starts, Smith has gone 19-5-1. However, outside of the divisional playoff game against the Saints last where Smith truly seemed to be in control, Smith has not managed to convince me that he is the guy for us. I appreciate his dedication to the team because he went through the worse of the worse out in the bay. I appreciate him wanting to be in San Fran. I appreciate his love for the game. I appreciate the way he has believed in himself since Harbaugh arrived. With that said, for all the games I have watched over the past two years, I have never seen Smith look as comfortable quarterbacking the offense as Kaep did last night. Kaep was in command. I knew he was a good QB coming out of Nevada but sheesh, that was crazy. While I am still on the offense, did you all see the block Frank Gore laid on Lance Briggs? My goodness!! The 9ers played the way I had been expecting them to play all year, dominating on both sides of the ball. So what happens next? Good question. I am not ready to say Kaep deserves to be the QB but I do think he earned a second start with his performance last night. If the 9ers are going to be all about starting to add rings to their other hand then you have to go with the QB that gives you the best chance to make that happen. This is going to be interesting. Get your popcorn ready. Looks like we have a QB controversy in the bay. Too soon? Not. At. All. A DIFFERENT kind of concern for Cam…. The Cardiac Pack is still alive and well. The Wolfpack pulled out a 20-18 win after merryland’s Brad Craddock missed a 33 yard FG with two seconds left. DOINK! The Jets allllllllllllmost pulled off the upset of the Pats. So close, soooooo close. RG3 was sooooo close to pulling off the upset of the G-men, throwing a potential game winning TD to Santana Moss with less than two minutes left in the game. Eli then turns around and throws the game winning TD, 19 seconds later. Womp. Kansas State though? Ran all up and through the mountains of West Va. Sheeeeeeeesh. Dwight Howard had a memorable preseason debut with the Lakers…19 points, 12 rebounds, four blocks and two assists. Butter rum, that Thomas Robinson dunk over Howard’s back, WHEEEEEEEEW WHEEEEEE!! The Indiana Fever defeated the defending champs, Minnesota Lynx, to win its first WNBA Championship. Tamika Catchings was named MVP. Girl power! The San Francisco Giants, facing elimination, dominated game six, winning 6-1 to force a game seven in the NLCS. Game seven is tonight at 8:00. Ravens LB Terrell Suggs played in his first game of the season. The Texans welcome back present? A 43-13 rout. Womp. Suspended/Unsuspended Saints LB played in his first game since being suspended/unsuspended. His welcome back present was his team’s 35-28 win over the Bucs. I have a feeling he will be suspended again next week. Womp. Matt Kenseth won at the Kansas speedway. Brad Keselowski still holds the number one spot in the Chase for the Sprint Cup. Feathers were flying all over The Swamp Saturday as Florida blasted South Carolina 44-11. Chomp, Chomp, Chomp. BCS Standings…1)Bama 2)Florida 3)Kansas State 4)Oregon 5)Notre Dame. This is going to be real interesting. Venus Williams ended her two year drought by winning the Luxemborg Open. It was her 44th singles title. Oh yeah, you guessed it. The NHL is still frozen. Double womp. The debate happens all the time, who is the greatest football player of all-time? Marino? Brown? Montana? Sanders? Rice? Payton? Butkus? Brady? Manning? LT? Unitas? Smith? Sayers? I think it is safe to say the G.O.A.T. (Greatest Of All Time) resides on the offensive side of the ball. 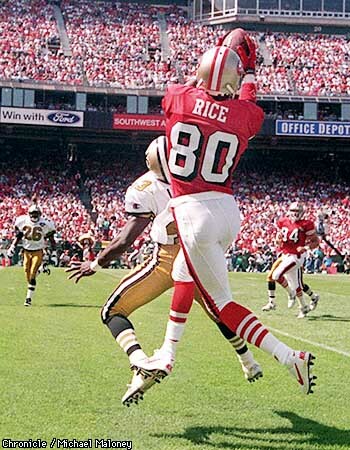 With that being said, to me there is no debate…JERRY LEE RICE is the G.O.A.T. 13 time Pro Bowler. 12 time All Pro selection. 3 Super Bowl rings. 1 Super Bowl MVP. 2 time NFL Offensive POY. 3 time NFC POY. Pro Football Hall of Fame inductee.